Your Life Path is considered the most important number in your numerology reading. Your Life path is the road you are traveling. Your Life Path is derived from your birth date. It reveals the opportunities and challenges you will face in life. Make a note of the values shown between brackets. For example, if you were born 3/23/1968, you would find 3 in the box for the Month of Birth, 5 for the Day of Birth, and 6 for the Year of Birth. 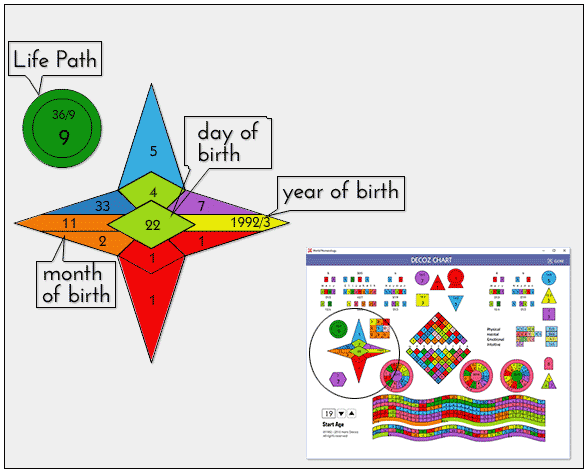 If you are interested in learning more in-depth numerology, the chart shown here was developed in 1982, computerized in 1984, and recently updated for the new World Numerology App. It is one of the three free numerology tools included with the download. If there was ever a moment of transformation, it was the moment of your birth. In that instant, you stepped into a new reality - the reality of human life and human consciousness. Even at that moment you were a person with your own unique character, as unique as your DNA.